Kia ora and haere mai, welcome to the tenth instalment of 9mm for 2018, and the 182nd overall edition of our long-running author interview series! Today I'm very pleased to welcome Ngaio Marsh Award-winning author Finn Bell to Crime Watch. 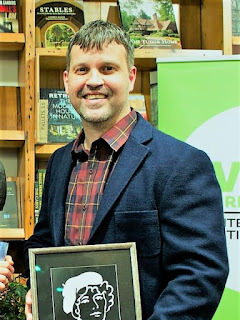 Originally from South Africa but now having been based in the south of New Zealand for several years, last year Finn became one of the 'finds' in the history of the Ngaio Marsh Awards. He made a big splash, making history in a variety of ways. He's the first ebook author to ever win a Ngaio Marsh Award (his debut, DEAD LEMONS, won the Ngaio Marsh Award for Best Crime Novel), and also the first author of any kind to have two books on the longlist in one year (DEAD LEMONS and PANCAKE MONEY were both longlisted for Best Crime Novel - PANCAKE MONEY was later named a finalist for that award to go along with Finn winning Best First Novel). "Bell is a wonderful new voice in crime writing, delivering a tense tale centred on an original, genuine, and vulnerable character," said the Ngaios judges of DEAD LEMONS, which opens with a man in a wheelchair dangling from a clifftop above a frigid sea. The man's drinking cost him his love, his job, and the use of his legs. After fleeing to Riverton at the tail end of New Zealand, he becomes obsessed with the historic disappearance of a father and daughter. Bell is trained in forensic psychology, and has said that he began writing his crime novels as a way of processing things he saw in his working life, which includes night shelter, hospitals, and prisons. His third novel, THE EASTER MAKE BELIEVERS, is entered in this year's Ngaio Marsh Awards, so perhaps Bell can make history again. But for now, he becomes the 182nd crime writer to stare down the barrel of 9mm. That's a hard one - it changes over time (or more accurately becomes a confused sort of tie for first place depending on what kind of day I'm having, how much hope I need and how far my mind has wandered from whatever my brain is actually supposed to be busy with). Definitely, my first was the seminal and iconic Sherlock Holmes (this was before I could even read myself). My grandfather had this big, leather bound hard cover book with gold tint on the page edges, 'The Complete Sherlock Holmes by Sir Arthur Conan Doyle' in severe font embossed on the cover. He would read me those stories from since before I can remember then later I started reading them myself (still do). In due course Mr Holmes started sharing the top spot with Samuel Vimes (from Terry Pratchett's supremely excellent 'The Discworld' series.) To this cadre I must add the accomplished and indefatigable Cormac McCarthy's Sheriff Ed (from NO COUNTRY FOR OLD MEN) and Alan Moore's Rorschach from his graphic novel series 'The Watchmen' (because even though they don't always recur in books they do so in my head.) If I could choose which imaginary friends follow me around all day it would be them. Following on from my answer above and (being more specific), the very first Sherlock Holmes tale I read entirely on my own and out loud too (although I had to ask my grandfather how to pronounce some of the big words) was "The Adventure of the Speckled Band". Which remains to me one of Doyle's best. At the time I couldn't tell you why I liked it so much except that it made me feel something, something that I kept thinking about long after. Later I began to value how it manages to turn the safely familiar into the sinister-ly macabre in such an effortless way, and I grew to appreciate it also for the simple yet effective mechanics of the story and how it works. To me it remains one of the finest examples of a locked room mystery I've read. None of the above. 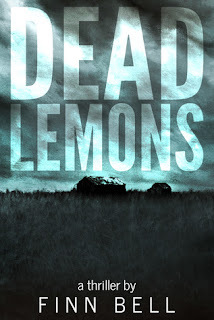 DEAD LEMONS was my very first book and it grew unplanned out of a process where I started writing daily, keeping a journal, not with the intention of publishing, or even of writing anything coherent or close to fiction but rather as a kind of therapy for myself. (Still do really). I'd love it if I was more interesting than I am but to be honest: Sometimes I sit and think but mostly I just sit. Occasionally I perpetrate random acts of woodwork that I foist onto (sometimes non-consenting) friends and family. I try to balance the sitting equally between reading fiction and non-fiction (in the same way that I try to balance eating too much cheese with eating too much chocolate), but I do interrupt these projects regularly to make time for wondering what my cat is thinking when he gets that look. Go out to Aramoana beach. (Leave your phone, watch and conversation in the car.) Wait till it's full dark when the wind dies and your eyes get used to the stars then walk from the Spit to the Mole to the Cliff. (Take it slow and don't bother the penguins, they've had a long day, the fur seals bite too). It would be great if I could be cast somewhere half-way between Morgan Freeman and Ryan Gosling but in reality it would probably be closer to Adam Sandler and Danny DeVito. DEAD LEMONS, because: 1. I (uncharacteristically) based the main character's character flaws on the (many) flaws in my own character so it was fun to write. 2. I know all those people (the supporting cast in the book), I grew up with them, most days they still have arguments about my life decisions in my head so it was nice to give them something useful to do for a change. At this stage I'm self-published and my books are only available online as ebooks - so I've never been accepted for publication (never even applied actually) and although I've released my third book (and three more on the way) I've never had a single copy of any of them in print. Never held a book in my hand. We'll see - ask me again later. I've never been to any of those (but I hope to) ask me again later. Thank you Finn! We appreciate you chatting to Crime Watch. You can learn more about Finn Bell and his Ngaios-winning crime tales at his website, and follow him on Twitter. Finn Bell will be appearing at the free Murder in the Library event at Dunedin City Library in Moray Place, at 6pm tomorrow (Thursday 5 April 2018). This may actually be Finn's first-ever books event as an author. 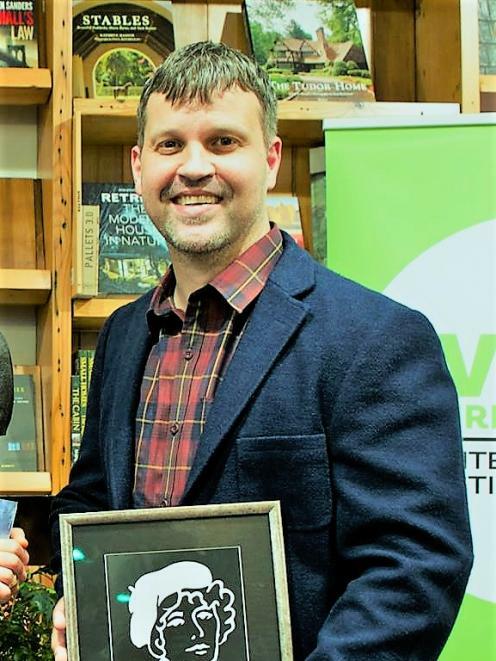 Head along to see him chat with Ngaio Marsh Award winner Liam McIlvanney, 3x Ngaios finalist Vanda Symon, and award-winning young adult thriller writer Ella West.